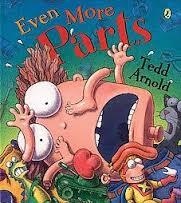 Speech Language City: Book of the Week: Even More Parts! Book of the Week: Even More Parts! I'll be working with K-5 students in a wonderful elementary school in Maryland. It feels so great to have my job lined up and a couple more summer months to settle in and plan! Now on to the Book of the Week: I decided to continue with the idioms theme I had going on in my previous post. Check out my Book of the Week post: In a Pickle: And Other Funny Idioms for more activity ideas. The students get really engrossed in the pictures in this book! We go on a “picture tour” and then read it through once. After reading, ask the students what idioms they remember from the book, and to describe what the expression really means. Ask them to describe a situation in which they might use the idiom. Go back through the book to review any that were not brought up in the discussion. Take it a step further and ask the students, “Why would you use an idiom?” “Why would you say, ‘It’s raining cats and dogs’ rather than just, ‘It’s raining really hard?” Target response: idioms are used to emphasize your message, express a complicated idea in a shorter or more clever way, and make what you have to say more meaningful and memorable. Also, it’s fun to play with your words! o For older students, Scholastic recommends having them draw an idiom from a cup and make up a skit to describe its meaning. I think this is a great idea if you are working in a classroom setting! For a smaller pull-out group, you could have students draw idioms but make up a short story (present orally or written) to describe it’s meaning rather than act it out. Here is my listof idioms to use with grab bag activities - Just cut them apart and put them in a jar or envelope. o For older students, use songs! I made an “Idioms In Songs” activity using PowerPoint that the kids really love. I’m not sharing the Powerpoint because it would be a copyright violation since the song clips are embedded in it. But I’ve provided the teacher’s guide (page 1-3) that has the YouTube links and video start/stop times. You can make your own Powerpoint or use the links directly from the teacher's guide. The accompanying student worksheet (pages 4-5) has the lyrics printed out for the students to read along as the song is being played and circle/highlight the idioms. Print pages 1-2 and 4-5 front and back to conserve paper! o Continue to add to the idiom wall (or start one!). Have students illustrate and provide a “showing sentence” for a few idioms from the book. In addition to targeting idioms, this book also lends itself to goals for rhyming words and labeling body parts. It's really a great addition to any SLP library - such a versatile selection. Stayed tuned for more idiom fun with my multiple choice meanings flashcards, coming later on!